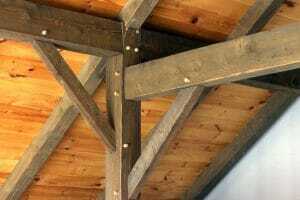 Traditional woodworking joints and modern woodworking joints can be quite similar. Modern joints may be cut with routers, so there could be a radius in the corners where a traditional joint might be square, or there may be some steel added for reinforcement. Traditional joinery refers to using mortise and tenons and dovetails instead of using steel clips to join members together.